I have seen people ask the question: MPEG makes many very successful standard but many are not widely used. Why do you make so many standards? I know they ask this question because they dare not ask this other question “Why don’t you make just the good standards?”. They do not do it because they know that the easy answer would be the famous phrase attributed to John Wanamaker: “Half the money I spend on advertising is wasted; the trouble is I don’t know which half”. In this article I do not want to brush off a serious question with an aphorism. When MPEG decides on developing a standard and when a company decides on developing a product face similar problems. Therefore, I will first compare the processes to develop a company product and an MPEG standard, highlighting the similarities and the differences. Then I analyse some successes and failures of MPEG standards. I will also explain how MPEG can turn standards that should apparently be doomed to failure to an unexpected success. Those looking for the perfect recipe that will lead to only successful standards should look at Mr. Wanamaker’s epigones, in the hope they have found an answer to his question. A standard is the product that MPEG delivers to its customers. I would first like to show that the process used by a company to develop a product is somehow aligned to the MPEG process of standard development – with some remarkable differences. Product proposal: process is hard to compare. Any company has its own processs. In MPEG, proposals can come to the fore spontaneously from any member. Proposal justification: process is hard to compare. Any company has its own specific means to assess the viability of a proposed new product. In MPEG, when enough support exists, first the context in which the idea would be applied and for what purposes is documented. Then MPEG develops use cases to prove that a standard implementing the idea would support the use cases better than it is possible today or make possible use cases that today are not. As an entity, MPEG does not make “market studies” (because it does not have the means). It relies instead on members bringing relevant information into the committee when “context and objectives” and “use cases” are developed. Requirements definition: happens under different names and processes in companies and in MPEG. Technology availability is quite different. A company often owns a technology as a result of some R&D effort. If it does not have a technology for a product, it either develops it or acquires it. MPEG, too, does “own” a body of technologies, but typically a new proposal requires new technology. While MPEG members may know that a technology is actually available, they may not be allowed to talk about it. Therefore, MPEG needs in general two steps: 1) to become aware of technology (via CfE) and 2) to have the technology available (via CfP). In some cases, like in Systems standards, MPEG members may develop the technology collaboratively from a clean sheet of paper. Design resource availability is very different in the two environments. If a company sees a product opportunity, it has the means to deploy the appropriate resources (well, that also depends on internal product advocates’ influence). If MPEG sees a standard opportunity, it has no means to “command” members to do something because members report to their companies, not to MPEG. It would be great if some MPEG members who insist on MPEG pursuing certain opportunities without offering resources to achieve them understood this. Product approval: is very different in the two environments. Companies have their own internal processes to approve products. In MPEG the project for a new standard is approved by the shareholders, i.e. by the NBs, the simple majority of which must approve the project and a minimum of five NBs must commit resources to execute it. Design development: is very different in the two environments. Companies have their own internal processes to design a new product. In MPEG work obviously stops at the design phase but it entails the following steps: 1) Test Model creation, 2) Core Experiments execution, 3) Working Drafts development and 4) Standard improvement though NB balloting. Design approval: is very different in the two environments. Companies have their own internal processes to approve the design of a new product. In MPEG, again, the shareholders, i.e. the NBs, approve the standard with a qualified majority. What is certainly common in the two processes is that the market response to the company product or to the MPEG standard is anybody’s guess. Some products/standards are widely successful, some fare so and so, and some are simply rejected by the market. Companies have resources that allow them to put in place other strategies to reduce the number of failures, but it is a reality that even companies darling of the market stumble from time to time. MPEG, being an organisation whose basis of operation is consensus, has advantages and disadvantages compared to a company. Let us see now how MPEG has managed the uncertainty surrounding its standards. An interesting case is MPEG-1. The project was driven by the idea of video interactivity on CD and digital audio broadcasting. MPEG-1 did not have commercial success for both targets. However, Video CD, not even in the radar when MPEG-1 was started, used MPEG-1 and sold 1 billion units (and tens of billion CDs). MP3, too, was also not in the radar when MPEG-1 was approved and some members even argumented against the inclusion of such a “complex” technology into the standard. I doubt there is anybody now regretting the decision to make MP3 part of the MPEG-1 standard. If there is, it is for completely different reasons. The reason why the standard was eventually successful is that MPEG-1 was designed as a system (VCD is exactly that), but its parts were designed to be usable as stand-alone components (as in MP3). The second case is MPEG-2. The project was driven by the idea of making television digital. When the first 3 MPEG-2 parts (Systems-Video-Audio) were consolidated, the possibility to use MPEG-2 for interactive video services on the telecom and cable networks became real. MPEG-2 Audio did not fare well in broadcasting (the demand for multichannel was also not there), but it did fare well in other domains. In any case many thought that MPEG-1 Audio delivered just enough. MPEG-2 AAC did fare well in broadcasting and laid the ground for the 20-year long MPEG-4 Audio ride. 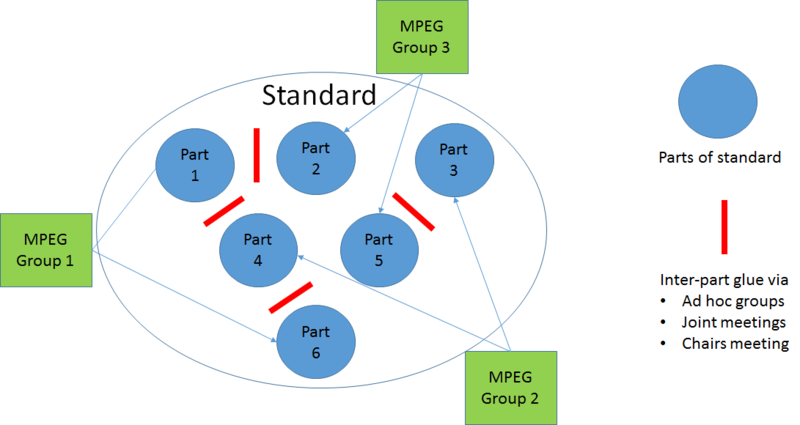 MPEG started the Digital Storage Media Command and Control (DSM-CC) standard (part 6 of MPEG-2). The DSM-CC carousel is used in broadcasting because it provides the means for a set top box to access various types of information that a broadcaster sends/updates at regular intervals. MPEG-4 is rich in relevant examples. The MPEG-4 model was a 3D scene populated by “objects” that could be 1) static or dynamic, 2) natural or synthetic, 3) audio or visual in any combination. BIFS (the MPEG name for the 3D scene technology, an extension of VRML) did not fly (but VRML did not fly either). However, 10 years later the Korea-originated Digital Multimedia Broadcasting technology, which used BIFS scaled down to 2D, had a significant success in radio broadcasting. Much of the MPEG-4 video work was driven by the idea of video “objects” which, along with BIFS, did not fly (the standard specified video objects but did not say how to make them, because that was an encoder issue). For a few years, MPEG-4 video was used in various environments. Unfortunately the main use – video streaming – was stopped by the “content fees” clause of the licensing terms. Part 10 of MPEG-4 Advanced Video Coding (AVC) was very successful, especially because patent holders did not repeat some of the mistakes they had made for MPEG-4 Visual. None of the 3 “royalty free” (Option 1 in ISO language) MPEG-4 video coding standards did fly, showing that in ISO today it is not practically possible to make a media-related standard that does not require onerous licensing of thirty party technology. The MPEG-4 Parametric coding for high-quality audio did not fly, but a particular tool in it – Parametric Stereo (PS) – could very efficiently encode stereo music as a mono signal plus a small amount of side-information. MPEG combined the PS tool with HE-AAC and produced HE-AAC v2, an audio decoder that is on board of billions of mobile handsets today as it enables transmission of a stereo signal at 32 kb/s with very good audio quality. Different groups with different competences develop the different parts of a standard. Some parts are designed to work together with others in systems identified in the Context-Objectives-Use cases phase. However, the parts are not tightly bound because in general it is possible to use them separately. The MPEG-7 project was driven by the idea of a world rich of audio-video-multimedia descriptors that would allow users to navigate the large amount of media content expected at that time and that we have today. Content descriptors were expressed in verbose XML, a tool at odds with the MPEG bit-thrifty approach. So MPEG developed the first standard for XML compression, a technology adopted in many fields. Of MPEG-A is remarkable the Common Media Application Format (CMAF) standard. Several technologies drawn from different MPEG standards are integrated to efficiently deliver large scale, possibly protected, video applications, e.g. streaming of televised events. CMAF Segments can be delivered once to edge servers in content delivery networks, then accessed from cache by thousands of streaming video players without additional network backbone traffic or transmission delay. MPEG-V – Media context and control is another typical example. The work was initiated in the wake of the success of Second Life, a service that looked like it could take over the world. The purpose of part 4 of MPEG-V Virtual world object characteristics was not to standardise a Second Life like service but the interfaces that would allow a user to move assets from one virtual space to another virtual space. The number of Second Life users dived and part 4 never took off. Other parts of MPEG-V concern formats and interfaces to enrich the the audio-visual user experience with, say, a breeze when there is a little wind in the movie, a smell when you are in a field of violets etc. So far, this apparently interesting extension of the user experience did not fly, but MPEG-V provides a very solid communication framework for sensors and actuator that finds use in other standards. The MPEG-H MPEG Media Transport (MMT) project showed how it is possible to innovate without destabilising existing markets. MPEG-2 Transport Stream (TS) has been in use for 25 years (and MPEG has received an Emmy for that) and will continue to be used for the foreseable future. But MPEG-2 TS shows the signs of time because it has been designed for a one-way channel – an obvious choice 25 years ago – while so much video distribution today happens on two-way channels. MMT uses IP transport instead of MPEG-2 TS transport and achieves content delivery unification in both one-way and two-way distribution channels. Is MPEG in the research business? The simple and flat answer is NO. However, MPEG CfPs are great promoters of corporate research because they push companies to improve their technologies to enable them to make successful proposals in response to CfPs. One of the reasons of MPEG success, but also of the difficulties highlighted in this article, is that, in the MPEG domain, standardisation is a process closer to research than to product design. Roughly speaking, in the MPEG standardisation process, research happens in two phases: in the companies, in preparation for CfEs or CfPs (MPEG calls this competitive phase) and in what MPEG calls collaborative phase, i.e. during the development of Core Experiments (of course this research phase is still done by the companies, but in the coordinating framework of an MPEG standard). The power of the MPEG competitive phase lies in the fact that MPEG receives many submissions from respondents to a CfP and pools together the components technologies. Therefore, the MPEG “product” has a much better performance than any autarchic product developed by an independent company because it uses many good technologies from many more companies than a single company could do. Actually, improvement is even greater and the MPEG collaborative phase offers another opportunity to do more research. This has a much more limited scope because it is in the context of optimising a subset of the entire scope of the standard, but the sum of many small optimisations can provide big gains in performance. The shortcoming of this process is the possible introduction of a large number of IP items for a gain that some may may well consider not to justify the added IP onus and complexity. With its MPEG-5 project MPEG is trying to see if a suitably placed lower limit to performance improvements can help solve the problems identified in the HEVC standard. MPEG has a large number of successful standards. For many of them the unit of measure is billion of units, be they hardware, software and firmware. MPEG has also had failures. The reasons for these can be manifold. One that is often quoted by outsiders is “the standard was too technology driven”. Of course technology plays an important part in MPEG standards. But then, what should MPEG do? Stop standards that are too technology driven? And how much is too much? Excluding technology would be a mistake as I will show in two examples. If MPEG had done that, we would not have MP3. In 1992 layer 3 was a costly appendix to Layer 1 and 2 that just did a good job. If we had done that, we would not have Point Cloud Compression (now at CD level), a standard that industry dies for today. Sure, MPEG should establish firmer contacts with market needs, but the necessary expertise can only be provided by companies sending experts to MPEG. MPEG needs more market, but do not expect that more market will necessarily have miraculous effects. The basic logic that has guided MPEG when making a decision on a standard has been “if there is a legitimate request to have a standard (within the constraints of 50% + 1 approval and 5 countries willing to provide experts to do the work), we do it”. More market information can certainly be useful to articulate a complete proposal and add more evidence at the time shareholders (NBs) vote. MPEG’s value is in its capability to produce standards that anticipate the needs of the market in a process that may take years from the time an idea is launched to the time the standard is produced. People in our age are volatile and so are the markets. In comparison technology is stable.